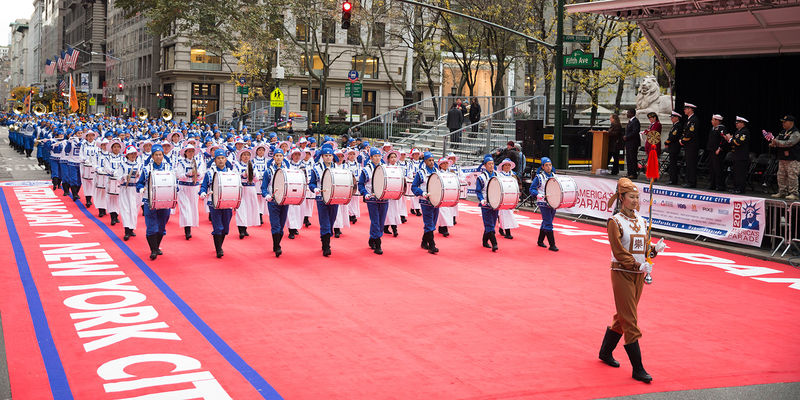 NEW YORK—At first, they seemed out of place in a parade showing appreciation for America’s veterans: a contingent, over 300-strong, of mainly Chinese faces marching down Fifth Avenue as part of the annual Veterans Day Parade. But practitioners of Falun Gong had a message that resonated with the crowd: freedom is not free, and Americans should treasure it. Leading the Falun Gong contingent was a marching band in white uniform with blue trimmings. About a dozen ladies carrying paper lanterns, dressed in pastel-colored traditional Chinese clothing, followed behind. Floats in the shape of lotus flowers accompanied them. Bringing up the rear was a waist drum group in golden costumes, beating their red waist drums. In the middle of the Falun Gong contingent, a solemn message: banners calling on the Chinese Communist Party to stop abusing and killing practitioners in China, and to prosecute Jiang Zemin, the former Party leader and chief perpetrator of the persecution. On July 20, 1999, the Chinese regime launched a sweeping suppression of Falun Gong, a traditional Chinese spiritual discipline whose adherents perform slow exercises and abide by the principles of truthfulness, compassion, and tolerance. According to Minghui.org, a clearinghouse for information on the persecution, over 3,900 practitioners were killed, and hundreds of thousands have been incarcerated. Researchers say the regime is harvesting the organs of live Falun Gong practitioners, killing them while making a profit.